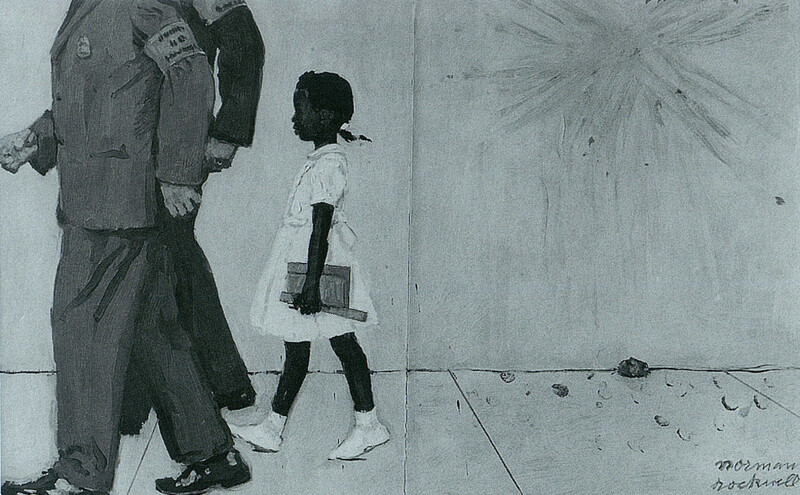 The Problem We All Live With done by Norman Perceval Rockwell is arguably the single most important image ever done of an African-American in illustration history. This piece is the most requested work at the Norman Rockwell museum in Stockbridge, Massachusetts. What makes this piece so monumental? 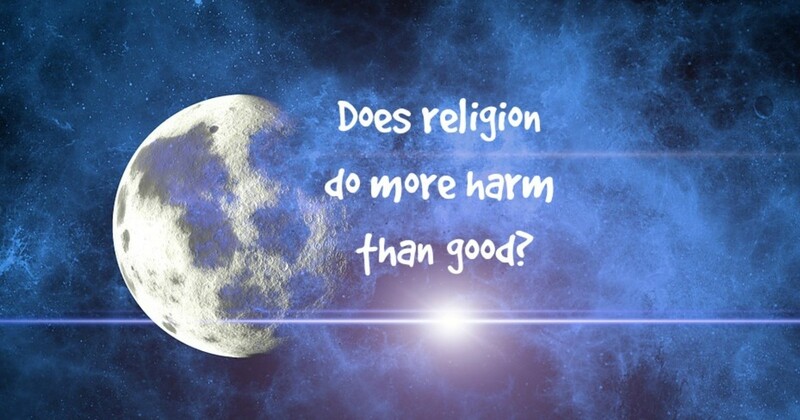 Why is this piece so popular and even controversial? First and foremost, it was done by Rockwell, the pitchman for conservative imagery for almost fifty years. No other artist was as well known by the masses as Rockwell for forty-six years people looked forward to Rockwell’s perfect small town scenarios on the cover of The Saturday Evening Post. All had grown to love Rockwell, as well as his art. He received mail by the bagfuls from adoring fans. 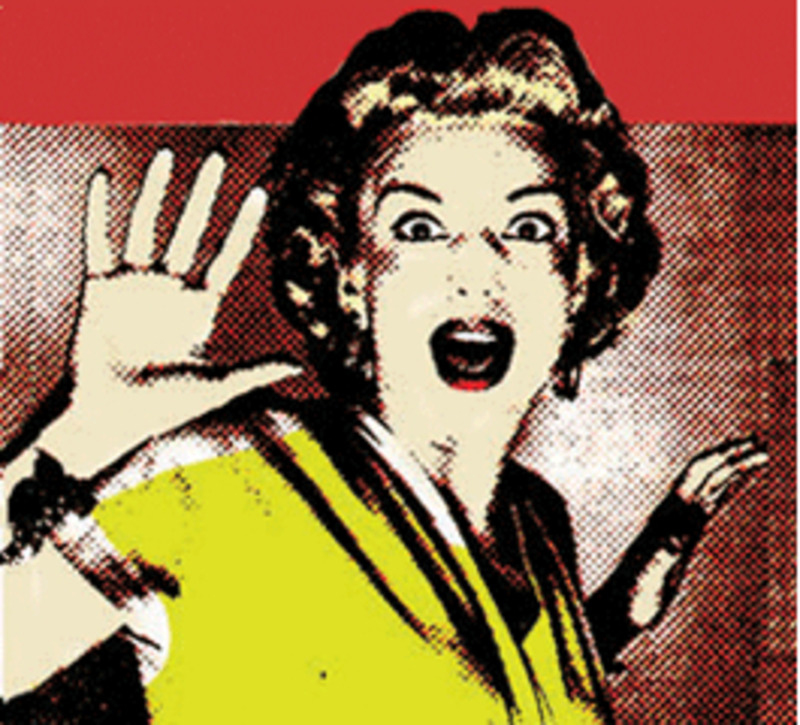 "What a shock it must have been to open up Look Magazine and see a double page spread with the words Norman Rockwell paints “The Problem We All Live With.” "The public, as well as the critics, must have been floored." Maureen Hart Hennessey points out with the Norman Rockwell Museum. The African-American, for the first time in Rockwells career, did not take a back seat in order to keep advertisers in a magazine. Norman Rockwell was released from the unwritten law that no blacks should be shown unless in subservient roles and the chains of artistic freedom where taken off in this piece. Norman Rockwell’s beloved and controversial painting will be the focus of this thesis. Much debate goes on regarding this most famous Rockwell image. Was the piece inspired by reported story of Ruby Bridges, or directly illustrated based on the words of John Steinbeck in Travels with Charley? 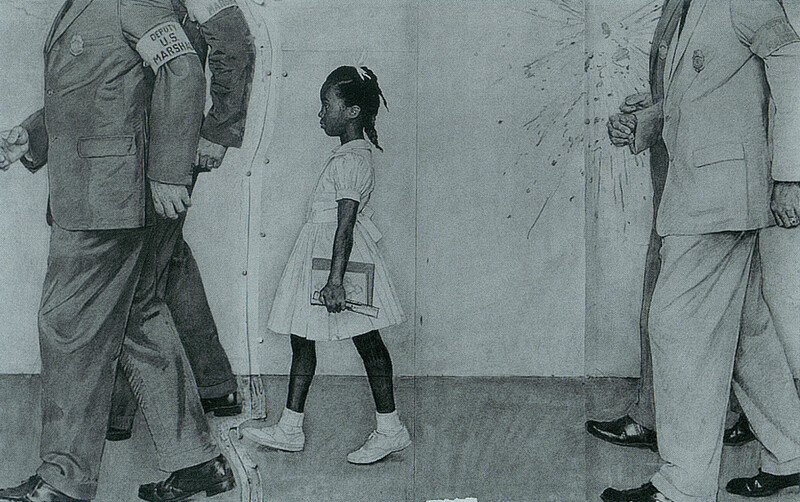 In Ruby Bridges’ own book, Through My Eyes,several indicators lead me to believe Rockwell was all too familiar with this incident that took place at Franz Elementary School in New Orleans, Louisiana. If this is the case then the wild notion by some in the academic community that Rockwell was actually saying the problem we all live with is the little girl or black people are the problem can be tossed out a window. Even the crazy idea that the white dress held some racist symbology will be dissolved upon this research. If one educates himself about the historical events of 1960 the assumption could easily be made that Rockwell was simply illustrating a story, as he so powerfully did throughout his career. The main difference is the story illustrated here is bitterly hard hitting and raw. 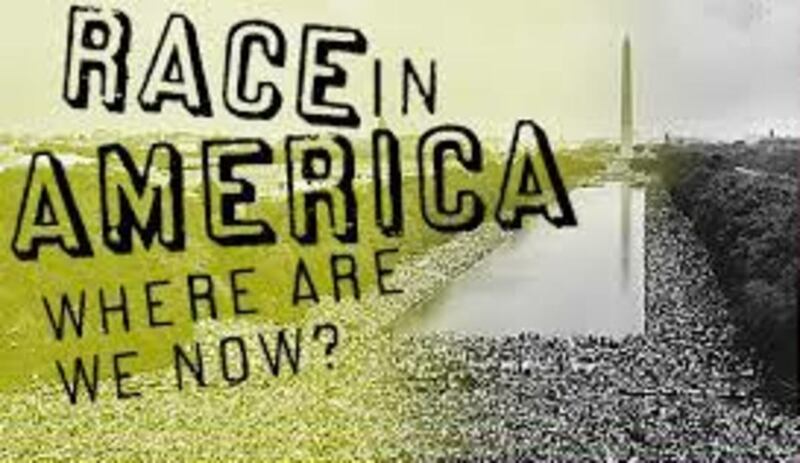 It was not Rockwell’s all so familiar perfect America, but rather a one hundred and eighty degree departure, as he depicts segregation and prejudice in its ugliest form. This reality is more provoking because he uses a harmless, innocent African-American child that just so happens to be wearing a white starched dress that most all children wore in the early 1960s. 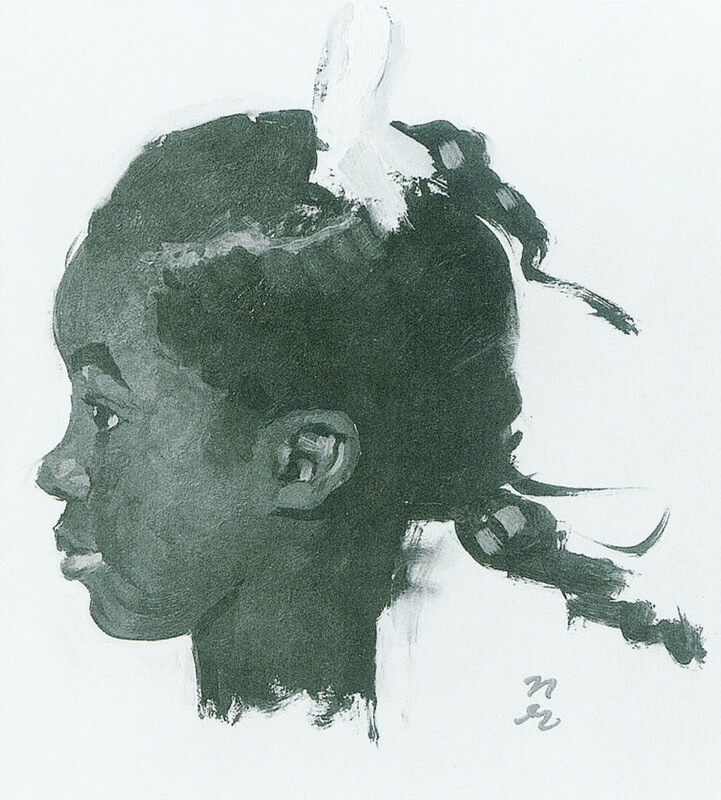 Norman Rockwell does not name the little girl, nor does he use a model that is a mirror image of Ruby Bridges, so yes, he was not one hundred percent accurate. I do, however, feel that he used Ruby Bridges story as his inspiration with no doubt in my mind. 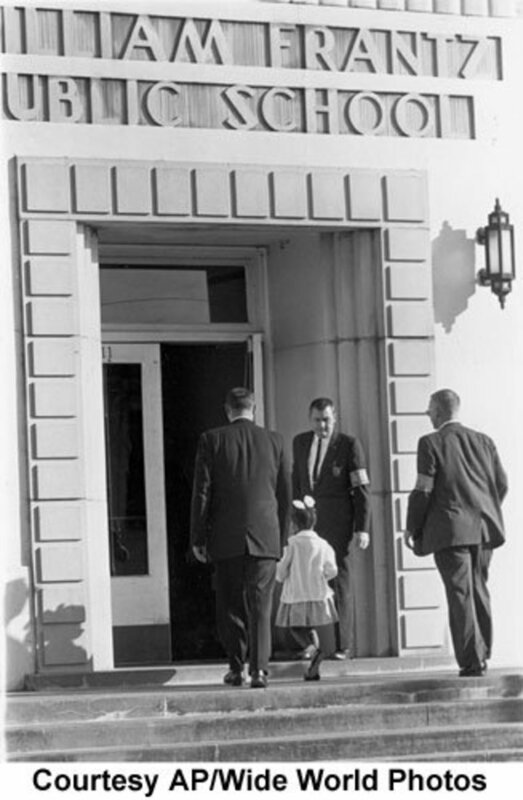 Rockwell might have died not even knowing the child’s name because it is said that they kept Ruby Bridges name out of there media to protect her. Travels With Charley cannot be found in the Rockwell library, so one may discredit the notion that he used this novel as inspiration. I conclude that he might have heard of the story on the news or read about the incident through the earlier excerpt from The New York Times. Walter Cronkite reported the incident in 1960 for the evening news so the national coverage gave the American people, including Rockwell, all the horrible details. Including eggs being thrown by segregationalist housewifes, words that were so bad that the sensors had to muffle the crowd noise and blot these hurtful, horrible words out of their coverage. To be so dead set on believing that Rockwell meant anything other than showing the terrible problem of racism in America in 1964 would mean you could not believe the story of Ruby Bridges and her plight four years earlier. 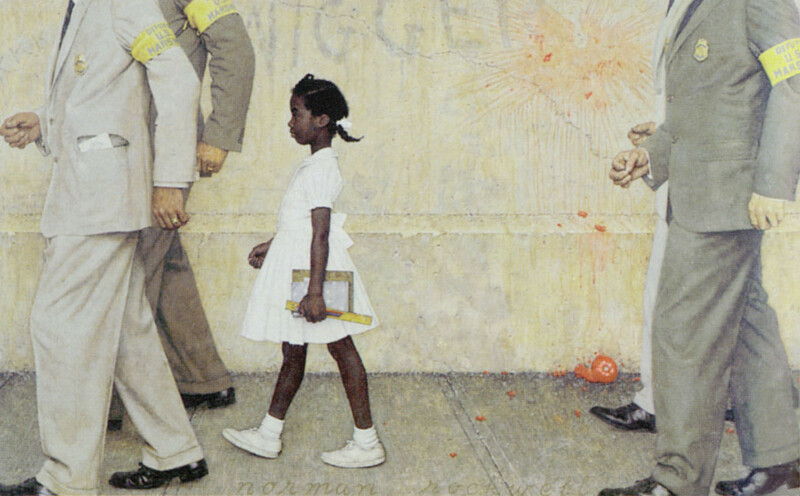 Rockwell’s painting is probably the mostly widely used image in school books today as Mareen Hart Hennessay quoted earlier. This was a great text. It really helped me understand Ruby Bridges more. She really was a great person who helped us all! I want to keep reading more about her. It really a cool and helpful piece of info. I am glad that you shared this helpful information with us. Please stay us up to date like this. Thanks for sharing. A very powerful message you have conveyed via this HUB. VOTED UP! Useful • Awesome • Beautiful • Interesting - But definitely NOT • Funny. Hello Ian, the movie is called "Ruby Bridges" it can be seen through Netflix DVD delivery. It is not available through streaming. Also look on Youtube, she has several speaking engagements, interviews and a visit to the White House when the portrait was hung. Thank you for this post. Ruby is my third cousin, my mother's second cousin. She is a sweetheart! I have to send the link to her! 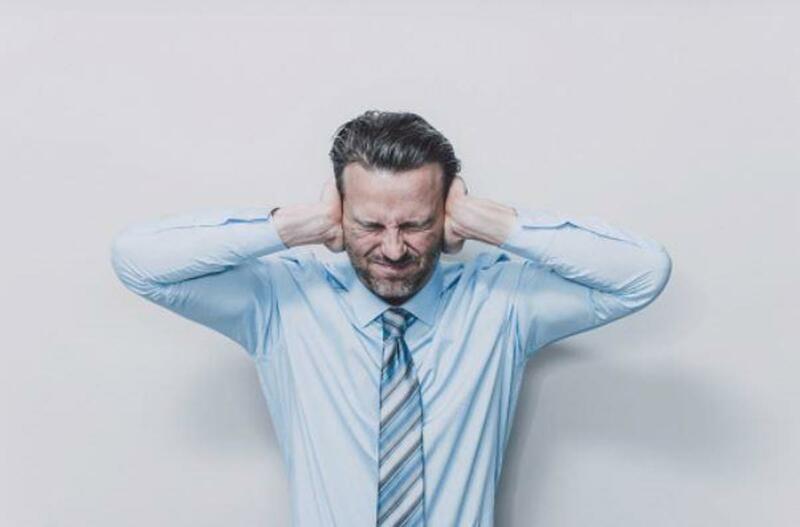 je suis francaise et vu que je suis la meilleure et que j'ai la flemme de les traduire, mettez les en francais bande d'ignorants ! Great article about a great painting about a great moment.Keep at it.Loved it.Nick. Bertrand céssé de faire peur a ces jeunes qui ne font que s'amusé vous n'avez donc rien d'autre a faire a votre age voyons !! Ici Cest la paillade cest la paillade cest la paillade !!! La téci cest pourri rentre chez toi youssef !!! Ajaccio et Bastia l'année prochaine sa va barder ! Le Psg 200 millions d'ivestissement pr finir 2nd de la Ligue Moi je dit BRAVO !! I first encountered this painting on the wall of an assistant principal during my first year as a teacher. 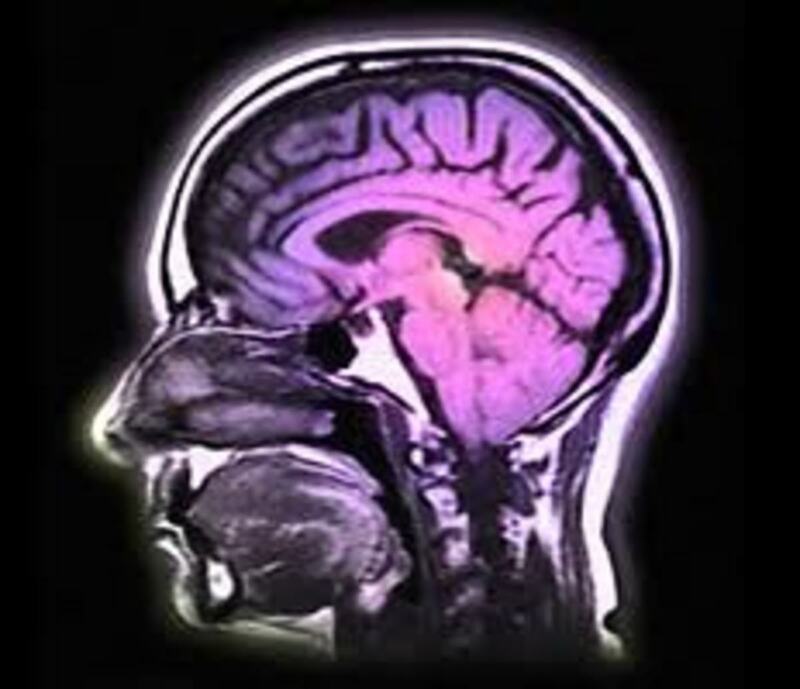 It owned me; it brought to the surface, and solidified, many of the inexpressible reasons I had spent the previous seven years earning a place in the profession. That was twenty years ago. I plan to be in the class room for another twenty years. Would that we give thanks for the bravery of children and painters. Nice article. Interesting article, but to say "'Travels With?Charley' cannot be found in the Rockwell library, so one may discredit the notion that he used this novel as inspiration" is simply illogical. Have the author never heard of a public library? Perhaps Rockwell lent the book to someone and never got it back. In addition, "Travels with Charley" is not a novel; it's a memoir. AND thank you Mr.Laird for writing such an elegant article. I am a 15 year old girl born in the United States with Hispanic origin. If it weren't for my accent and my name, everyone would have thought I am white. Even though I am young and might not no much about the world today or yesterday, I was moved when I saw this painting. I understood so much as to what it meant, but never really quite learned the historical events and the details of the story. After reading this article I feel like I understand more of the problem we all live with. Thank you Hubs for making this information available for us to read. I own a signed numbered copy (5/100) of this painting which was left to me by my father on his death. It's always been my favorite Rockwell. President Obama has kindly chosen Ruby Bridges Hall to remind us of work yet to be done and miles yet to be traveled. No public figure,let alone an American President, has endured such pure unmitigated hatred with such grace and courage. The President has saved our economy and saved our Constitutional Rights in the face of a sham menace created by our own elite of greedy first citizens. But, can he save us from ourselves? Ruby would think so. This is truly an amazing piece of our history. Thanks to the freedom of speech and expression. Rockwell spoke volumes. Rockwell covered the full spectrum of emotions for the American people who loved him. He had a sense of humor, as well as a sensitive spirit. I grew up in South Carolina in the 1950s and remember well the many instances of segregation. Schools in our city desegregated in 1964 and it was completely uneventful. We, as seventh graders accepted our new classmates as we did any new children. We were always excited to have someone new to talk to. Some communities were just not properly prepared and there was such a silly fear among the adults that the white children would somehow be tainted by the colored children. I don't know where people get such silly notions, but I was not raised that way and did not buy into it. It was almost like some kind of weird superstition. I have loved Rockwell's paintings all my life. They are America in all its ways. Some good, some funny, some sad as this, that tells about a side of us we can't deny - unfortunately. I remember this well, as I do other images of the civil rights movement. I was inspired by these people, and saw their non-violent movement work daily with Walter Cronkite, another American icon, and in the newspaper and our beloved Life magazine. This is a beautiful picture of a young girl whose courage I will never forget. A fitting picture to grace the White House and remind its current occupant why he is doing this job, as he must get discouraged by the racism directed at him by those who only see the color of his skin. I have a friend who grew up in the South, and he tells of when he was a small boy and saw a drinking fountain that said "white" and "colored". He thought colored water must be much more interesting than white water, and went to try it. His parents said "No, you can't do that," knowing full well the censure he would face for it. He left the South, but never forgot that incident. I linked black girl with your post, because if my children go to school, and one of the parents are black they are automatically labeled black. To be a child in the 60’s, and to view all of this, not to mention to be a part of history must have been imprinted on her face. I see evidence of this in this painting. Someone might object: the Bible is a “white man’s book.” The little girl is colored. That does not negate the statement just provided that God is not partial. The Bible is for peoples of all skin colors. It was not written by Europeans, but by Asiatic, Orientals. Yet, it was not to remain the private property of Orientals. God is a God of love. He did not create man and then favor one above the other because of his skin color. All have the same ancestor, including that terrified child. That can be proven if we look back far enough. To start your research use Luke chapter 3, and Matthew chapter 1. The genealogy of Jesus is traced back to Adam. How people change! The young girl pictured here if she’s still alive she would be my age. Happily we lived to see a black president. Good post, I enjoyed reading it, regards Jerry Gehen. Very nicely written. Not to nitpick, the school is spelled Frantz. And the chant was actually "Two, Four, Six, Eight. We don't want to intergrate." They were already segregated at that point. This is one of Rockwell's paintings that has spoken to me in so many ways. The fact that he could feel the true meaning of that moment in a picture speaks volumes. Being a young black female from the south and studing the history of this country along with listening to the stories from my parents and grandparents, one could hope that others out there can only begin to understand what this picture means. Thank you so very much for reminding us that its the little things in life (like this picture) that mean SO much. A nice storty- sad about what ruby had to go through as a child- but like the old quote reads, " that which will not break you; will only make you stronger"! I remember standing in front of the original painting at Stockbridge several years ago with tears running down my face...I have never been so moved by a piece of art. Thank you for this powerful and very important contribution to the national dialogue. I teach 8th grade Social Studies/English and we cover the Civil Rights period thorugh history resources and literature. This particular piece by Rockwell moves my students like no other visual. They just get it. The contrast of the tomatoe smashed against the wall is so important....and many students perceive it to be a symbol of blood and a clear evidence of rage..over an innocent small child dressed in her white dress. Thank you for your thesis on this painting. This was very touching and very well-written. Norman Rockwell will always be remembered with his heartwarming illustrations of the American life. For once, I am glad to see a Norman Rockwell's painting fell outside the usual sentimentality, so popular with the audience desperate for heartwarming experiences. such an important work of art; thank you for writing about it. I came upon this page after seeing Ruby Bridges on the "Today" show this morning. It seems that her experience in 1963 shaped the amazing person she became as an adult...a real inspiration. My uncle was one of the US Marshals who escorted Ruby into school that day. I was six years old in 1963, and remember it all very clearly. My Aunt (also a US Marshal), told me later that Norman Rockwell was told not to reveal the US Marshals faces, because of the death treats they received. While I can agree with the author’s statement that "The Problem We All Live With" by Norman Perceval Rockwell is the single most important image of an African-American in illustration history I strongly disagree with his assessment that Rockwell was "the pitchman for conservative imagery" and was somebody "who is embraced by the most conservative elements in our country." The book, told in anecdotal narratives, provides a first person account of two families who were unique because of both their disparity and their similarity. While they came from two economic ends of the spectrum – the Edgertons, poor dairy farmers/the Rockwells, successful due to Norman’s talents – they shared a love of family, a commitment to integrity, and a consideration of one another that created a closeness of friendship that mirrored the physical closeness of their two houses. wow thats a really good picture. i like it alot. Those of us who were alive when all of this was taking place can surely remember the searching of one's conscience. I had forgotten this picture but looking at it now I can remember staring at it for a long time and the impressions and thoughts it brought up. 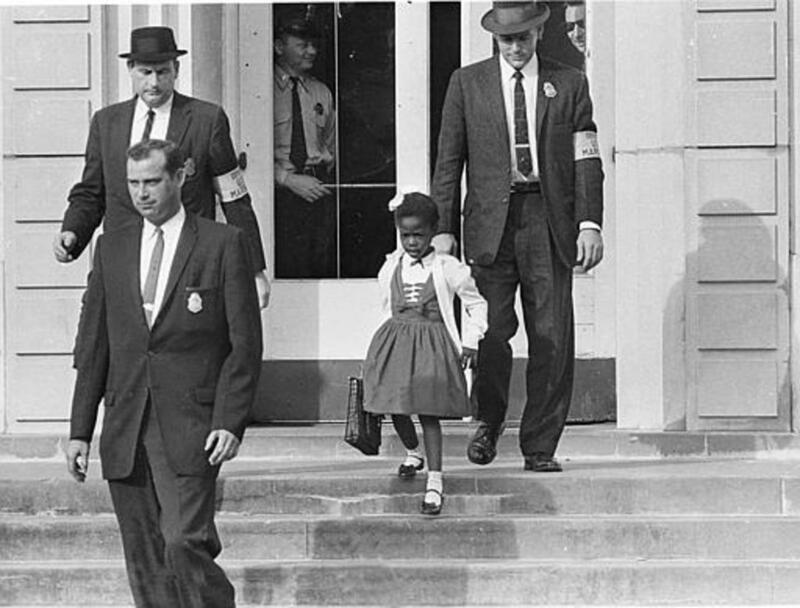 Thanks Peggy W I have included pics of Ruby Bridges being escorted to school. What Norman Rockwell did with his painting spoke volumes! Your descriptions of this painting were so well done that even if the photos were not included, people would have a great idea of what Rockwell had painted and the meaning behind it. This is an outstanding and exhaustive exposition of this single—and singular—painting. I never had any doubt what it was about from the first moment I laid my eyes on it. It was my second choice for a Rockwell for my American Art gallery, but I couldn't resist the "Girl with Black Eye." Now that I see this fine Hub, I am glad I didn't use it because it deserves the sort of explication you have expertly provided. Thank you very much.